The Plaid Parliament of Pwning participated in (and won) the first-ever MMA CTF in 2015 hosted by the Japanese team TokyoWesterns. 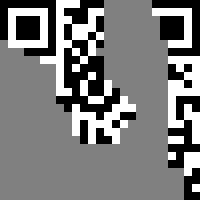 Here’s a writeup of one of the problems, which was to recover the contents of a corrupted QR code. It was categorized as a miscellaneous problem and worth 400 points (a medium-hard problem). 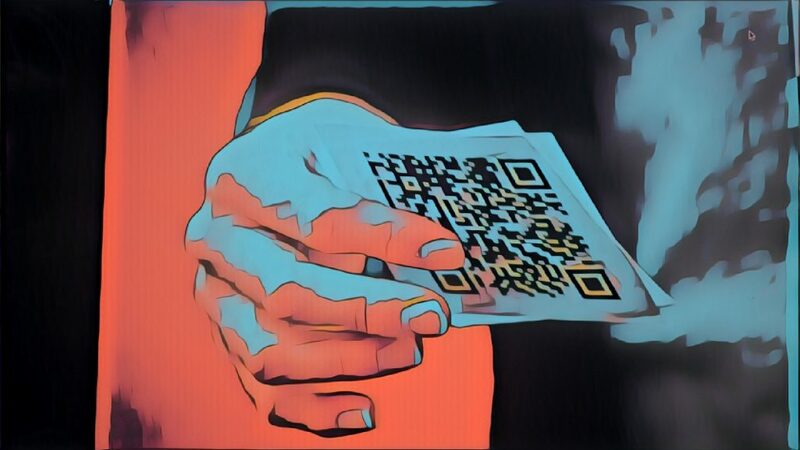 Obviously, if you try to scan the QR code with a normal reader, nothing will happen. I chose to solve this challenge by reconstructing and decoding the QR code by hand. 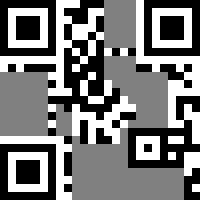 It’s pretty time-consuming but I learned a lot about how QR codes work in the process. I followed the steps in reverse, making repairs where necessary. Since we know exactly where the Finder, Timing and Alignment patterns are, we can reconstruct those pretty simply. Version 2 codes don’t have “Version Info” so we ignore that. Finally, for the Format Info, we have to reconstruct that based on what is visible. Alas, that still doesn’t scan. Guess we’ll try to extract the bits by hand. 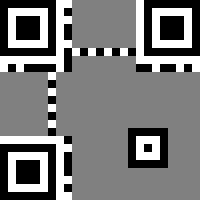 The QR code is masked to break up patterns (e.g. uniform regions, areas that look like QR code format patterns, etc.). The format has eight different mask patterns defined. 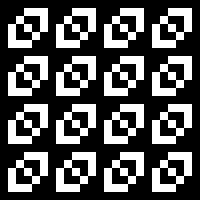 Each mask is a 6×6 repeating pattern which is XORed across the packed data bits. Now we just have to extract the data bits. There’s a lot of missing bits there. Maybe error correction can help? Because this is a version 2 code, there’s only one block of data and error bits. Therefore, no structuring is required: the error bits immediately follow the data bits. There’s a total of 22 data bytes and 22 error bytes, since we’re using a “Q”-level code. …until you look carefully at Reed-Solomon’s error correcting capabilities and realize that it can correct up to twice as many erasures – that is, if it knows where the errors are, the error correction capabilities are much stronger. That means our code can recover from up to 50% of the bytes being missing! But that means we can only correct up to 22 missing bytes; we’re missing 28. Maybe we can obtain some missing bytes based on the data encoding? Let’s set aside error correction coding for now and look at the data format. Our message starts with the bits 0010, which according to this table means the code is in the alphanumeric mode. 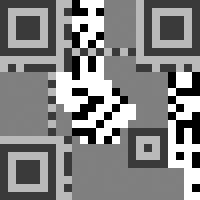 Since it’s a version 2 QR code, the next 9 bits are the length. Those bits are 000010100, which means that there are 20 characters. 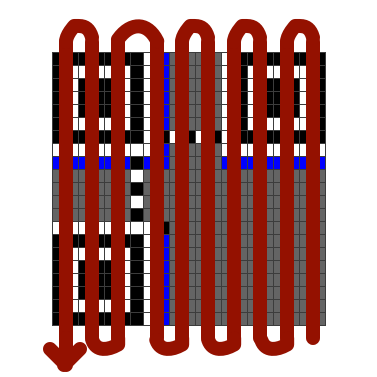 In the alphanumeric mode, every pair of characters is packed into an 11-bit chunk. Thus, there are a total of 110 bits for the payload. What a troll – the visible bits just say “FLAG IS”. Well, guess we’re definitely going to have to recover the flag itself from error correction. Woohoo! By adding the pad bytes that we already know (from the data encoding format), we have successfully recovered 6 bytes, bringing the total number of missing bytes down to 22. Now we can apply error correction! Happily, someone has already written a QR-compatible Reed-Solomon library for Python, so I don’t have to figure out all the nitty-gritty math involved. 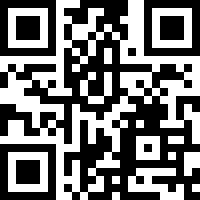 This was obtained by encoding the message using this online encoder; because of the stringency of the QR code spec, the output uses the same settings as the original code did, and so the same QR code is obtained.